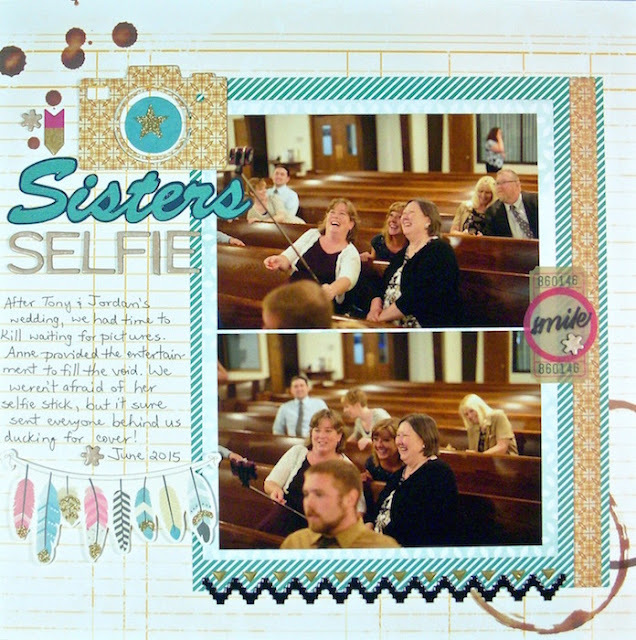 I have nothing against cropping, but using standard 4" x 6" photos is one sure quick way to make a scrapbook page. I have a few go to designs for working with photos this size. Here's one idea and some tips for designing the rest of the layout. This page is about my sisters and me killing time after a family wedding. (leave it to my youngest sibling to show up with her selfie stick) I stacked two landscape pictures and double matted them to create one substantial rectangle about 8 inches wide by 9.5 inches tall. The title and journaling fill the smaller column and a visual triangle of embellishments ties everything together. Now is that easy or what? You can see what the rest of the Creative Team at Get It Scrapped! did with their 4" x 6" photos in this article. Great layout - looks like y'all were having FUN! Love this page! Looks like you were having a lot of fun! I like the design of the page, I'll be coming back to get some ideas for scraplifting. These pictures of you and your sister are so cute. Your scrap book design looks great too. I wish I was creative enough to start scrapping myself.